Designed with value in mind, your Ameristar furnace uses natural gas or propane to keep your home warm during the winter and circulates cooled air to every room in the summer, keeping you comfortable year-round. –Choose between 80% or 95% AFUE (annual fuel utilization efficiency) rated furnaces. –Available in 80% single stage or 95% two stage for the level of comfort and efficiency you require. –Our 80% and 95% furnaces feature aluminized steel heat exchangers to conduct heat quickly and increase durability. –Our 95% two stage furnace provides better temperature control and quieter operation for improved comfort. All furnaces are fully convertible to work with either natural gas or propane, making them suitable for use in any area. 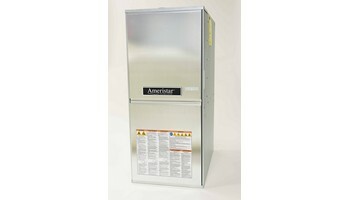 –Ameristar furnace cabinets are constructed of corrosion-resistant galvanized steel. –Our furnaces are built for flexibility to suit varied installation situations. AFUE stands for annual fuel utilization efficiency, which measures a furnace’s heating efficiency. The higher the percentage of AFUE, the less energy you’ll use to maintain pleasant temperatures. Ameristar’s variable speed indoor systems maintain constant and consistent airflow that improves comfort and efficiency in your home. When you get all the features you need in a furnace for less than you expected to pay, you’re getting real value. You’re getting an affordable solution from Ameristar.